Even at these settings, shutter speeds were too slow for hand-holding in most cases. The best shots were taken while propping the camera on any convenient stable surface. The tours move along at a brisk pace, so the best pictures were in spots where the guide stopped to discuss something at length–with a suitable firm surface handy. Very little time or flexibility to compose. I took quite a few shots, and the two featured are the best among them, such as they are. Mammoth Cave itself is mostly dry at the levels explored in the tours I took, so there are few fancy formations. The featured image really captures the very angular character of the cave here. 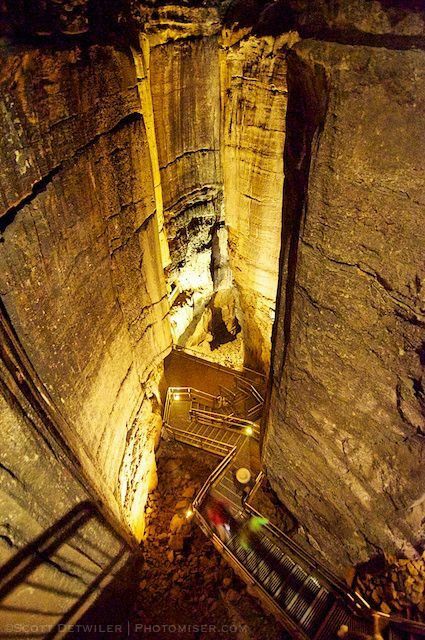 This entry was posted in One Picture a Day, Photomiser Gallery, Travel and tagged Cave, Mammoth Cave National Park, Tokina, Ultra wide angle lens.